Customer Feedback: Customers share about their experiences with Celebrate Communion's customer service and products. Check out the Testimonials page. 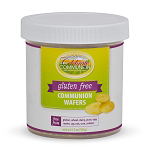 Communion Supplies from Celebrate Communion are Fresh, Healthy, Convenient and Affordable! Now your church can celebrate Communion with the highest quality Communion supplies, shipped fast and fresh from the great Northwest. 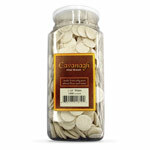 Try our prefilled Communion cups with wafers. They are spill-free and you'll only use what you need. Simply leave unused portions in your Communion trays for the next service. There's no need for refrigeration or cold storage. These prepackaged Communion sets stay fresh without refrigeration for over 10 months. We guarantee to ship you the freshest product and that your prefilled cups and wafers will be fresh and tasty when used by the date stamped on the box. Call 1-877-222-0771 for a FREE sample! Communion celebrations in Protestant churches are most often held weekly or monthly. The most common Communion supplies used for the remembrance of Jesus' Last Supper with the disciples are grape juice or wine and unleavened bread. Christian Communion is the sharing of a meal that remembers Jesus' sacrifice and celebrates the redemption He gave to the world through His life, death and resurrection. Sharing juice or wine in a chalice or in individual Communion cups and breaking unleavened bread together is a core expression of Christian faith. Unleavened bread has traditionally been used as part of Christian Holy Communion celebrations since Christ's Last Supper with the Apostles. As part of the Jewish Passover, unleavened bread was a central part of the traditional Jewish holiday celebrating the liberation of the people of Israel from slavery in Egypt. Exodus 12:1-76 describes how, after the Israelites were spared from the tenth plague which killed all first born in Egypt, they were told to journey to the Promised Land. In their haste, they took dough with them before it had been leavened. In commemorating the fact that their first born were spared, or passed over, unleavened bread became a traditional part of the Passover meal or Seder. It was Passover when Jesus sat down with His disciples to share the Last Supper. Unleavened bread was most certainly part of this meal. How do we celebrate Communion? Communion is celebrated in many different ways. Many Protestant churches use Communion cups filled with grape juice, passed or served in round Communion trays made out of brass or silver metals. 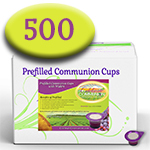 A relatively new product, the Prefilled Communion Cup with Wafer is an all in one Communion cup and wafer kit that has gained favor in recent years thanks to its convenience and healthier qualities. 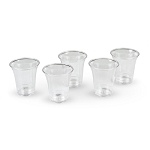 Prefilled Communion cups with wafers are an all in one Communion cup with bread-wafer set that keeps the elements safely sealed until it is time to partake, eliminating extra handling. Still, use of a common Communion cup is the preference of some churches. In this case a cup or chalice of grape juice or wine is passed from church member to church member. Is the new all in one Communion cup with bread concept appealing to you and your church? 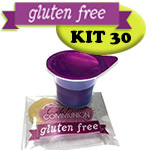 For a limited time you can order free samples from Celebrate Communion! When a common Communion cup is used, the faithful either take the bread or Communion wafers separately, or may dip the bread or wafer into the cup prior to partaking. This act of dipping unleavened Communion bread or wafers into a Communion cup is called intinction. What else is Communion called? Celebrate Communion prepared a handy scripture reference card for portable ministry and visitation. You are welcome to download this printable resource copy of “Preparing Our Hearts For Communion” to share with your small group or Bible study, originally posted in our blog article "Glad and Sincere Hearts."